Erastil (pronounced eh-RAS-til) is one of the oldest gods still worshiped in Alhara. His religion dates back to before the Age of Darkness when small farming communities and hunter-gatherers prayed to him for bountiful harvests and successful hunts. He is a god of the hunt and of farming, leading his followers by example and good deeds rather than flowery rhetoric. Erastil is an elder deity, his worship hearkening back to the time when mankind first set about harnessing the wilderness and mastering nature. 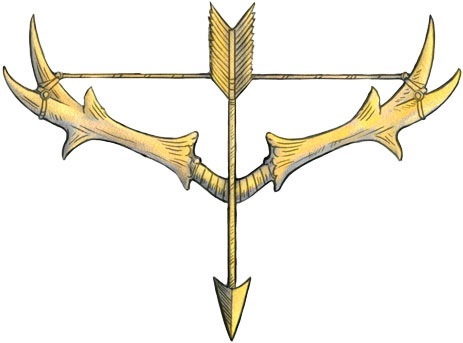 Legends claim that it was Old Deadeye himself who crafted the first bow and gifted it to humans, a gift to assist them in overcoming the challenges of the world. Even as the accomplishments of civilization mount, Erastil continues to embrace and represent the simpler pleasures life has to offer. Erastil teaches his followers to embrace traditional and simpler ways of life, free of the constraints of modern civilization, a trait that often results in disagreements with more progressive deities such as Abadar; this difference in opinion leads to increasing conflict between these deities' respective clergies. Depictions of Erastil are commonplace in the homes of his followers. Such images usually portray the deity as either an aged human with the bow and gear of a trapper, or as an elk-headed humanoid. These depictions often show Old Deadeye holding fast against various beasts and animals of the wilds. In times of need, Erastil has also been known to appear to lost hunters in the form of a stag. 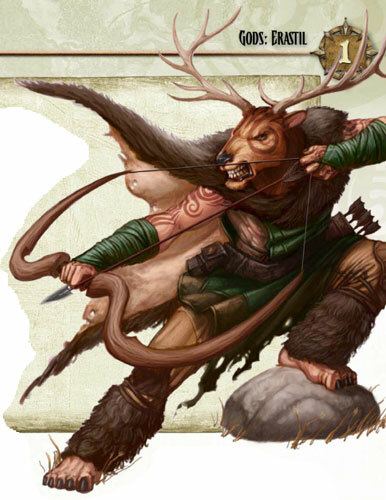 Creatures held in high esteem by Old Deadeye include elk, deer, and other hooved animals. Those who please Erastil are often rewarded by increased yields, both from farm and field, while earning his disfavor can lead to damaged or ruined crops and poor hunting. Erastil's herald is known as the Grim White Stag. It has the appearance of a gigantic white stag with branches in place of its antlers and vines wrapping around its legs. This servant is a ruby-toned heavy horse that understands Common but does not speak. This servant is an eagle-archer that has the power of shape-shifting. This servant of Erastil is a divine boar. This minion is a young treant who possesses a rather brash temperament. Erastil teaches his followers to embrace tradition and the old ways. Many of Old Deadeye's faithful never even enter a city, and his faithful can be found in nearly any wild or untamed region across Avistan; his worship is particularly well established in the nations of Fahldane, Ceralais and among the Phoenix Tribe. The faithful of Erastil can be found in nearly every wilderness community in Avistan. They usually choose to live simple lives and practice his teachings away from the complications of more advanced societies. The members of Old Deadeye's clergy are active in their respective communities, leading by example and serving in various capacities as needed by those that live around them. The clergy's formal dress is kept simple to reflect their deity's tastes; a simple cloak of fur or leather, usually accompanied by Erastil's holy symbol burned into the hide or worn as part of a wooden clasp. Sites dedicated to Erastil are simple affairs, even in more civilized locations; shrines are usually nothing more than a wooden building or house serving communities of his faithful. Just as Old Deadeye emphasizes the simple things in life, his shrines focus on providing for his follower's more practical needs. Ceremony and formality are often abandoned in such locations, which instead act simply as a place to pray, or to sleep.